THE KONGMA SAKYONG, JAMPAL TRINLEY DRADÜL: Greetings and good morning to everyone. I’m addressing you today from Berlin. It has been an amazing summer of travelling and teaching for me. Many of you have been to some of the programs that I was teaching. It feels like an appropriate time for me to share some thoughts about this particular Harvest of Peace day. 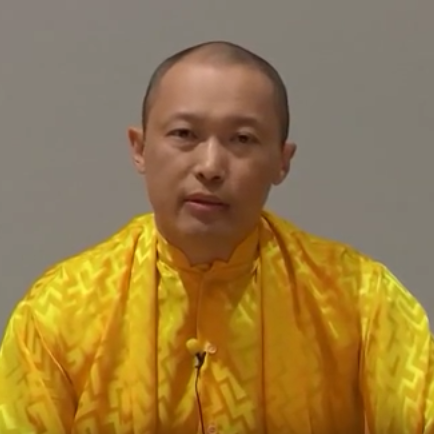 I just want to make connection with all of you at your centers and wherever you may be viewing this; it’s really wonderful that everybody has gathered. I’m personally delighted be able to communicate some ideas and experiences that hopefully will be meaningful to you. Before we do that, I would like to send the warmest greetings from the Sakyong Wangmo, Jetsun Drukmo, Jetsun Yudra, and our newest one, Jetsun Dzedron. They are all doing well. Last year at the same time I had more family around me, but today you get just me. I would like to address you about the notion of household and how we live. Whether we live in a very simple accommodation or in a more busy and expanded lifestyle—no matter how we’re living—the basic notion of household is a core message of Shambhala. Traditionally, thangkas that are centuries old depict the kingdom of Shambhala as many households, many small houses, that surround the Rigden who, as a sense of enlightened rulership and living, himself manifests with the Rigden queen and family. So at the heart of Shambhala is very much this notion of household. The notion of household may seem far from our everyday life, especially when you look at the world with its many heartbreaking and challenging issues in the environment, politics, health, or education—many areas of the world. Over the years, as Shambhala, we’ve been slowly involving ourselves with such global issues. Even though that is incredibly important—we have to be part of it, we cannot avoid it—at the immediate level, we sometimes become overwhelmed by what is happening in the world. Sometimes we feel helpless in terms of what we can do, and other times we do participate in different activities and ways of engaging. At the same time, I feel like household is a way through which all of us can participate. In particular, the notion of household is not so much how we manage our personal life, separate from the rest of world. As Shambhala, household is connected with the power and confidence we feel in the principle of basic goodness and human dignity. How we live our life day-to-day is an expression of a cultural confidence. So as practitioners and warriors in the Shambhala tradition, right now all of us want to look at how to investigate and examine how we are living. How we live within our home, and the attitude by which we live, are very powerful. The home becomes an expression of who we are and what we are. So household is not just necessarily about the details of how we arrange our life, even though that is important. It is about how relating to our home and to the rooms in our home, as well as how we relate to food and to conversation—how we relate to all these elements—is building an invisible environment in which we are swimming and engaged. All these elements, which we may think of as mundane or worldly, are actually very, very powerful generators of energy. How we relate to our dressing process, how we relate to the food, and the whole thing, is very much creating a culture of how we participate. In our modern world, everything is very quick and efficient, and there’s always a sense of rushing and greeting the next thing. But through practice and the notions of mindfulness, awareness, and lungta, we realize that it’s very important to be present. We can’t always just be planning for the next thing. So culture in our home is really about how we manifest and how we live. Obviously there’s a sense of renewal in terms of rest and relaxation. There’s the notion of entertainment, how we enjoy. There’s also the notion of sharing—what we like to express. There’s a notion of deepening in terms of our own spiritual path and meditation. There’s also the notion of imagination and how we come up with new ideas and themes. All these are very important and we need to balance them. From this point of view, if we are not trying to move our own culture in a particular direction, then naturally how we live is just a reaction to everything else going on from the outside. Then our home never feels like we are really moving forward, but always just reacting. As a culture that is relating to basic goodness—basic goodness of ourselves, basic goodness of others, and basic goodness of society—how can we actually use the home, our own living situation, as the progenitor and the basis of this kind of culture? How do you relate to space and to the environment from a point of basic goodness? I think these elements are already existing. People are trying to live a good life as much as possible; we’re very much engaged in that, generally. Obviously most of us sometimes feel like things are going well, and sometimes feel like things are not going well. But regardless of the ups and downs of life—a natural part of our existence—how can we have an underlying theme of journey, vision, meaning, and principle? How can we take these principles and actually engage in them? Naturally, it takes a balance between discipline and relaxation. We need a sense of the discipline of living. When I asked my father what his favorite word was, he said “discipline.” That’s not just a matter of being narrow-minded or uptight, but of engaging in things that actually raise our energy and lungta, as opposed to just thinking that we can get by without putting out any energy or effort. At the same time, how do we overcome this notion of perpetually engaging in overworking or exhausting ourselves? Those are elements we have to balance. We’ll be exploring some of these themes for the rest of our lives, and this is something I feel like we can discuss at the Shambhala center and within our own home situation. This year I’m especially happy that at Enlightened Society Assembly and many of the other programs, we actually have Shambhala Household texts and ways of working with these themes that are essential in terms of embodying these principles. Another element of household is the notion of balance. How do we have balance in our life? This is challenging for everyone in terms of our practice, our work, and how we relate with the inner development of our personal sense of purpose, as well as how we relate to life externally. Balancing is a primary challenge of modern living. Once we are out of balance, we are continuously trying to make up for the balance. There has to be a balance of how we relate to our own self, our own self-identity—who we think we are and how we manage ourselves—and how we relate to other—the balance of self and other. There is also the balance of practice and living. There is the balance of view and action. Then there is literally the balance throughout the day. One of the tools we have in the Shambhala tradition is the principle of what we do in the morning, what we do in the afternoon, and what we do in the evening. The days are divided up according to our own sense of how we live. There’s a sense of vision in the morning, a sense of engagement in the afternoon, and a sense of rest and renewal in the evening. We also have how we relate to all the aspects of the rooms in our house, and how we relate to the different activities that we do. All of these can actually be engaged in and imbued with the principles that we have. This is essential for all of us. Balance is something that has to happen on a daily basis; it’s not a trick that we discover once and are able to apply to everything. There’s a balance of how we relate to the week, to the month, and to the year. There’s a balance of how we relate to our food and how we relate to conversation—all these elements. Generally speaking, with balance there is some kind of harmony. Harmony has to do with strength, renewal, and windhorse. Whether we are in a leadership position or just engaging in practice, we can try to look at how we are balancing these principles. At the heart of it is the notion of energy, lungta, and spirit. Hopefully everybody can look at this element and engage in it. When we use these elements of culture, how we manifest personally—and the confidence we have as Shambhalians in order to know how to live—don’t just stay in our head and our heart. They actually manifest as household, which is the seed of creating enlightened society. If we can carry the culture of basic goodness in our homes, then each of us creates that energy—as opposed to it being just at the Shambhala center or just in our meditation—and our living becomes an actual example of it. Most of us are challenged by our life. This is an opportunity for us to be able to reverse that process. These are some of the thoughts and themes I wanted to share today. Hopefully you will contemplate them and have a discussion to share experiences of your life—where you feel like it’s in balance or out of balance, how you can engage in these elements, and how we have an opportunity to lead life with the inherent principles of Shambhala wisdom that so enrich us. So please enjoy this day and this transition. It’s an excellent time to reflect on how you are going forward. This has been a wonderful opportunity for me to address you, and to send my love and blessings. I know many of you are engaged in many, many positive things, and some of you are very much challenged by what is happening in your life, so I hope some of these principles that I talked about are helpful to you. On that note, good morning. I look forward to seeing you soon. I will keep all of you in my thoughts and prayers. Okay.